While most designers are already showing autumn/winter collections in their windows, high street is still finishing off their sales. 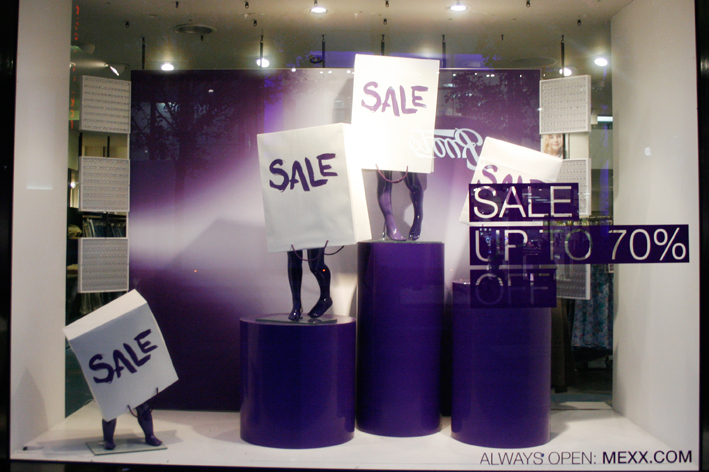 Sale windows never excite me as much as new season schemes, but I did spot couple of clever ideas. KG by Kurt Geiger, Regent St. 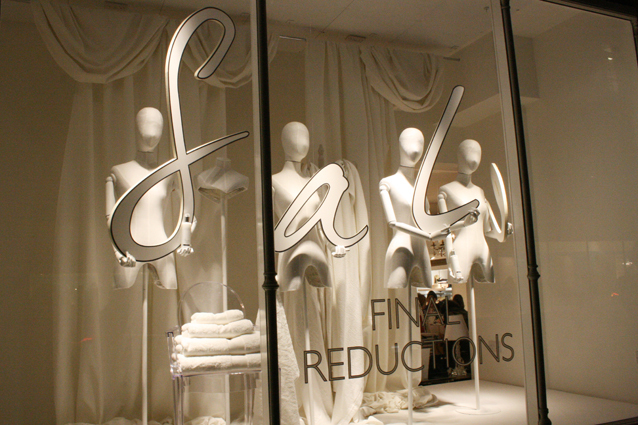 I had pictures of these windows when they were full price and I love the mannequins’ poses. They’re also very similar to the advertising campaign they were running at the time. 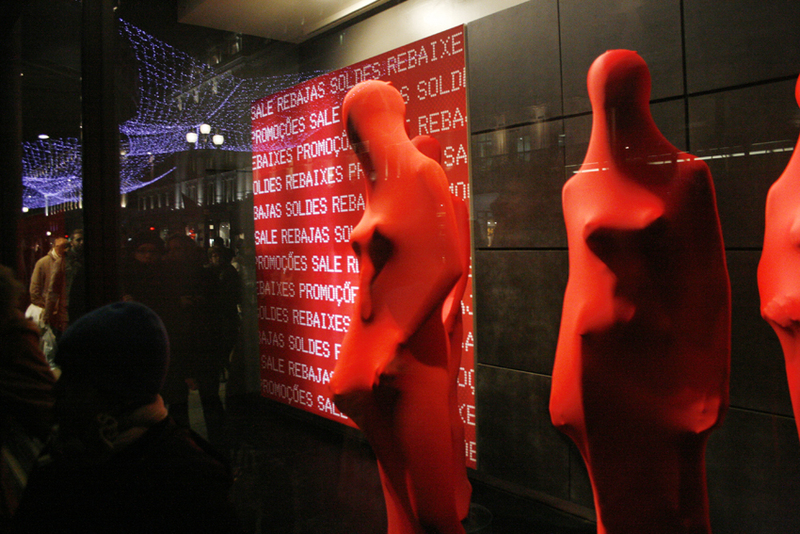 The red swimming costumes are like made for the sale windows. 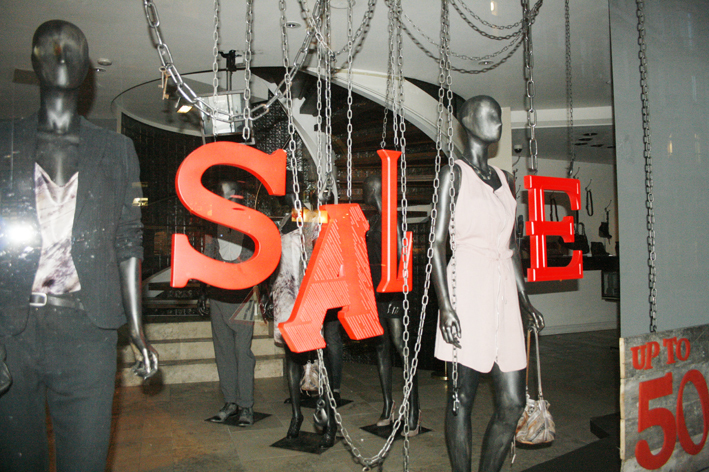 Love the mannequin on top of the letters, and yeah check out the SALE- shoe stands. 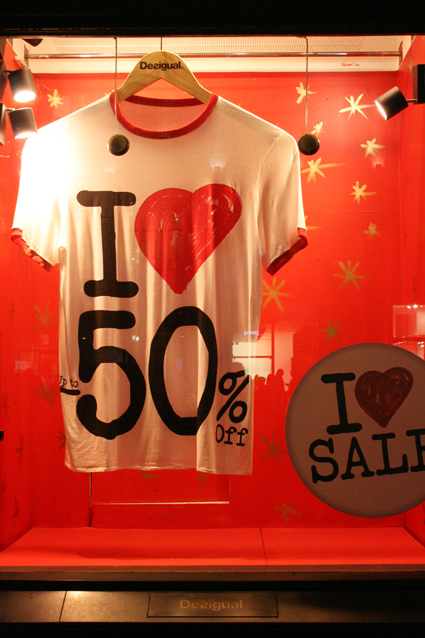 Mexx, Oxford St went for an unusual sale colour. 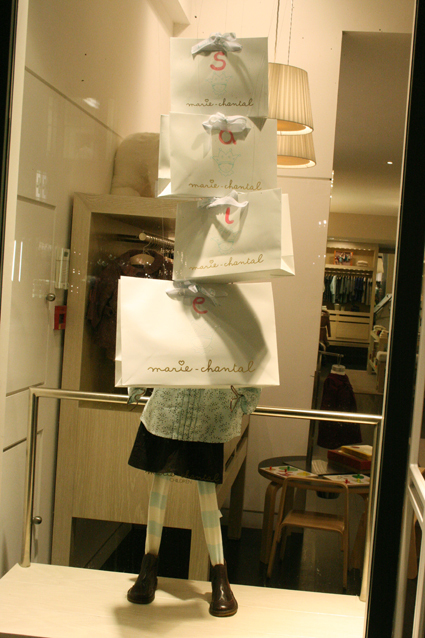 The bags on top of the mannequins look quite funky. Diesel, Bond Street always seem to make effort when in sale. 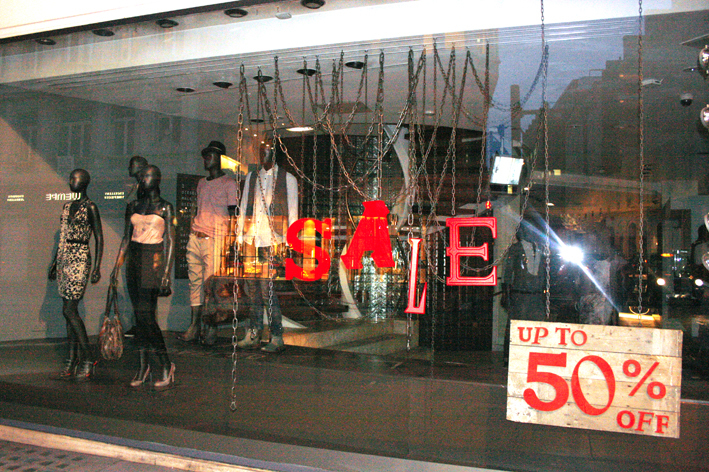 This time it’s sale letters on metal chains. Looks very raw and street, which works for the brand brilliantly. I have to say they had left the windows unlit, so I had to use flash to get anything to show on camera. 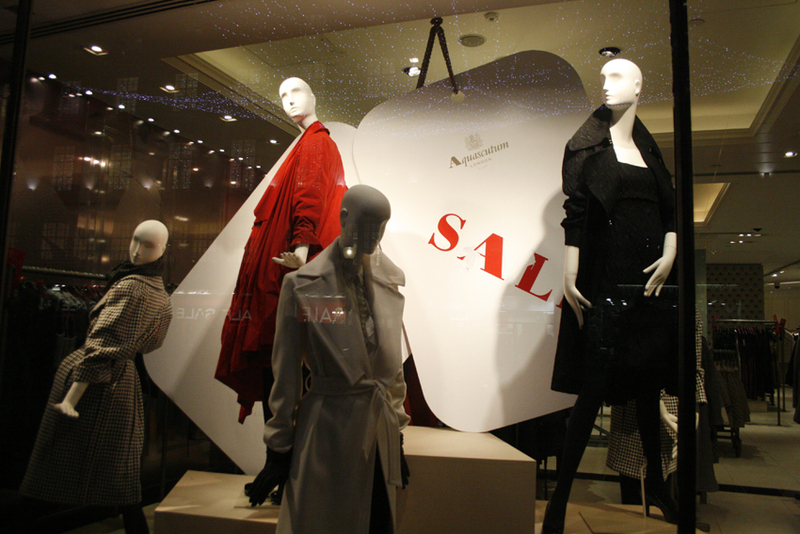 Esprit, Regent St are using sale letters hanging of the mannequins’ necks as well as white and red sweaters. It was snowing last night and to me London looked great. It’s funny how people have digged out their Hunter wellies. Now there are two occasions when they can be used as a fashion statement: summer festivals and January snow. 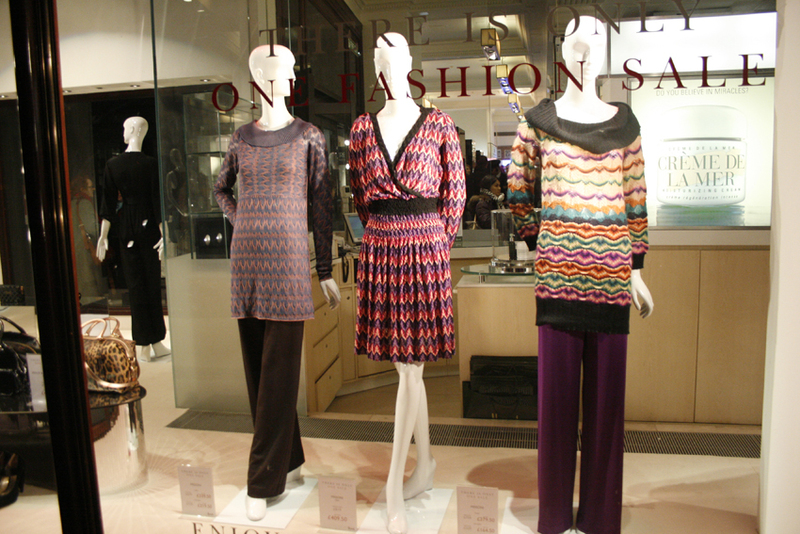 Some shops are still in sale, but a few are already showing spring collections. 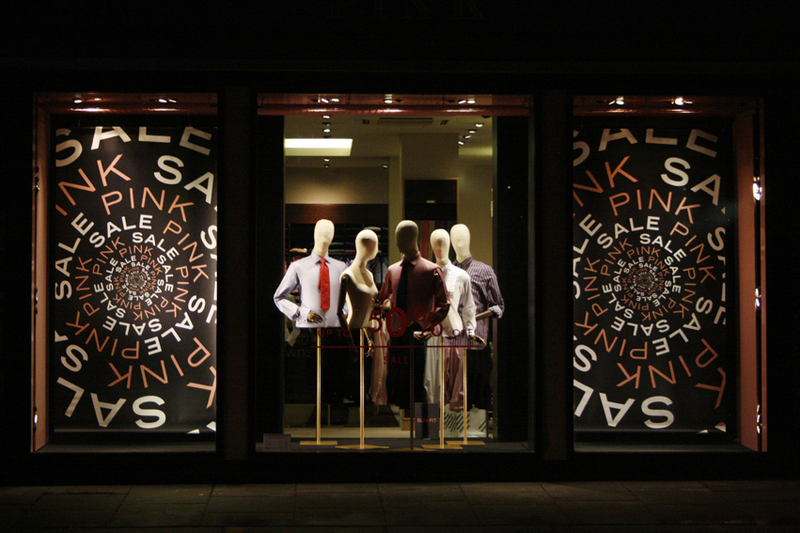 Here are some more examples of the sale windows. I wonder why they didn’t give themselves five stars? The mannequins are like showgirls, so I understand the styling. Sometimes if you accessorize lingerie too much it can look a little dodgy.. I wonder what colour they’re going for Valentines Day as they’re already doing pink? 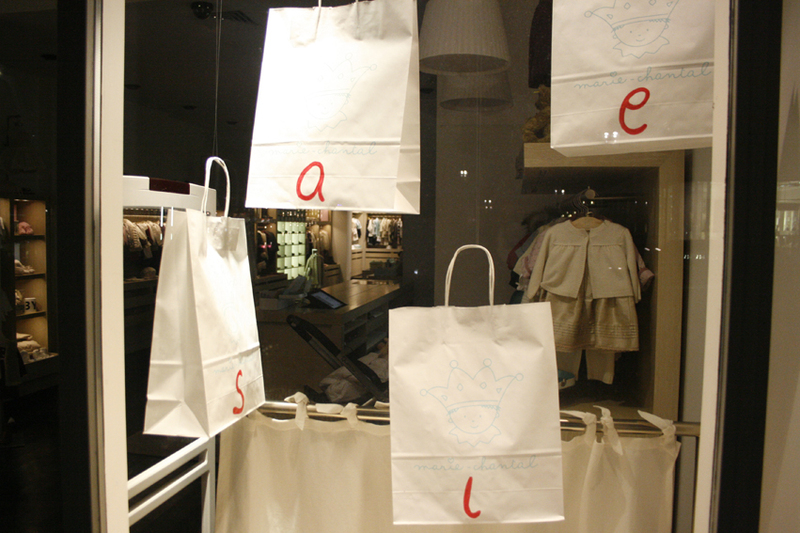 Marie Chantal had sale written across four shopping bags, but it really wasn’t that effective because the letters are very small, and the bags kept spinning around so that you wouldn’t even see them that well. 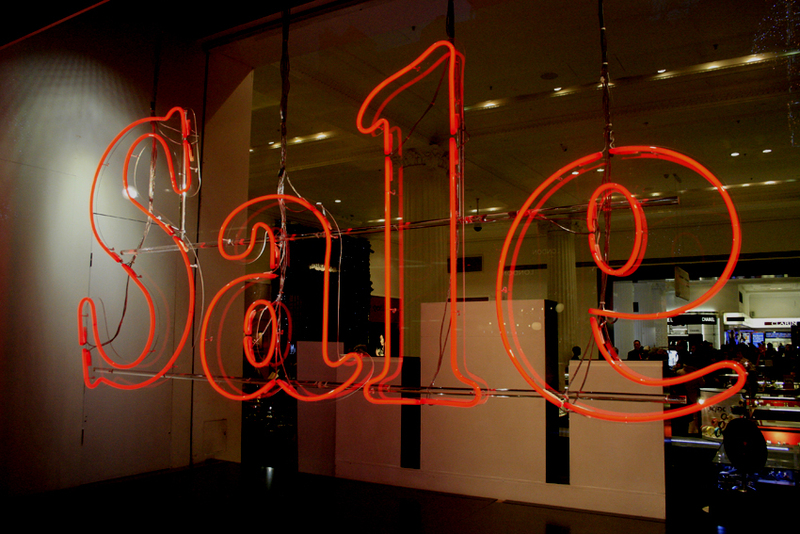 Harrods sale message is always: ‘There is only one sale’. Some of their windows were still in Christmas mode, but all the main ones covered with vinyl. The sale ends the 23rd, so can’t wait to see their first Spring scheme. Red, red, red and more red. 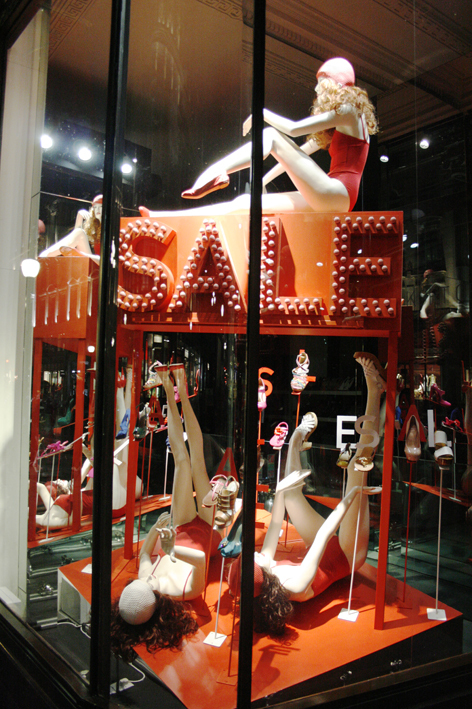 Sale time is great for shoppers but not so exciting for window displays. 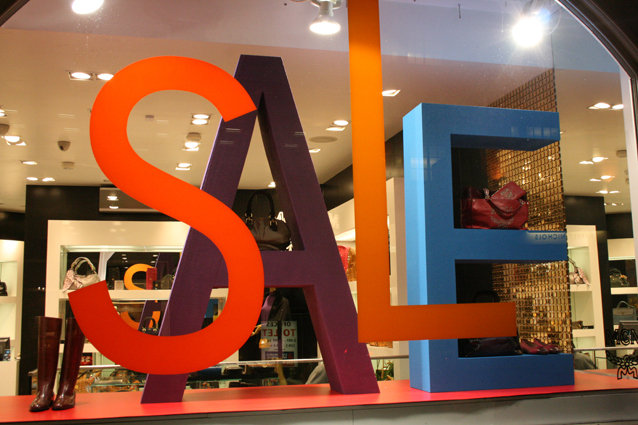 Most shops just use banners, but there are other ways to say SALE like big 3D letters (fairly popular), on a shopping bag (ground breaking..) or just using lots of red. 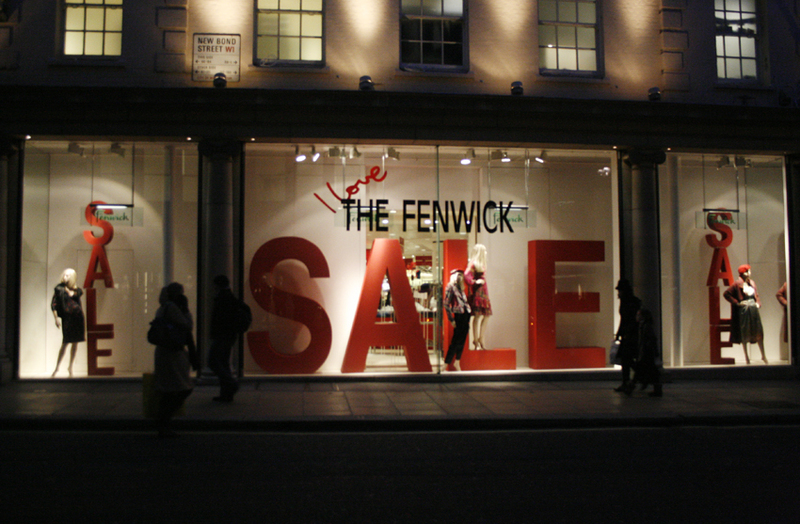 Fenwick on Bond Street. 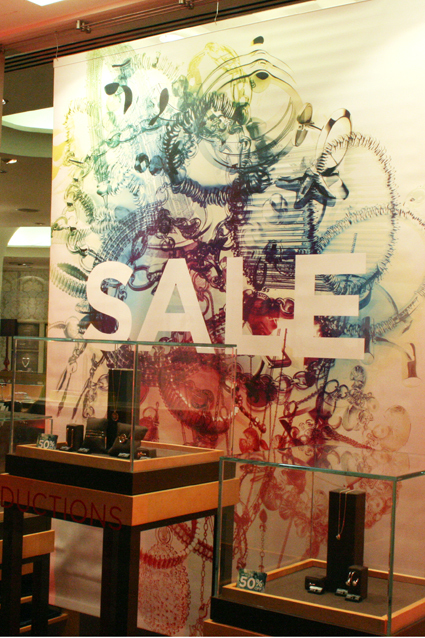 I like the way the models are interacting with the sale message. 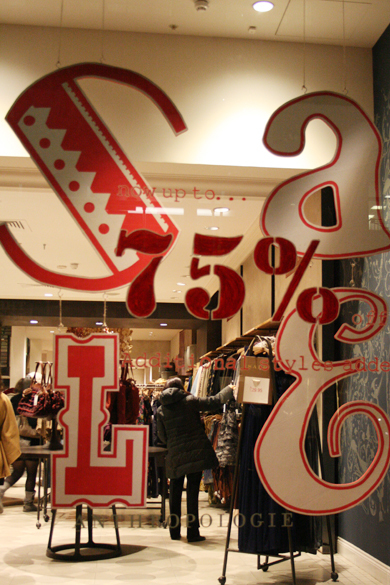 Festive sale letters at Jaeger. 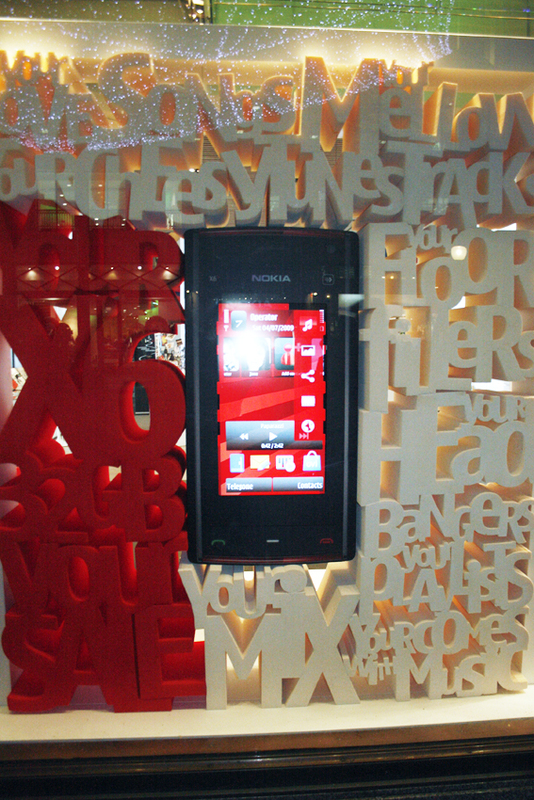 Sale message mixed in with other catchy foamex words at Nokia. Light bulb letters at FCUK. They used the same light boards for their Christmas scheme (which I unfortunately have no pictures of, sorry), and actually started their sale way before Christmas (I know this because I’m sad lol). Kurt Geiger, Regent Street. Another light bulb neon sign, who’s copying who, hah? 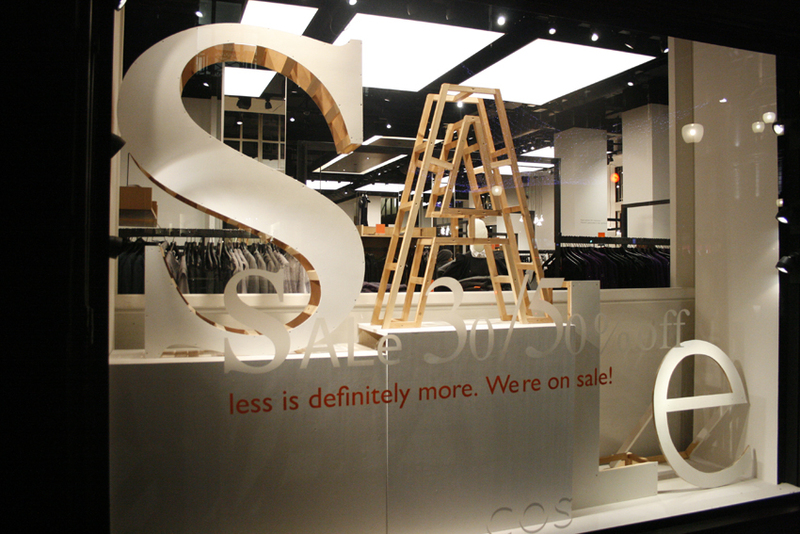 Cos, Regent street. Wooden letters, and not even red. What is going on?? 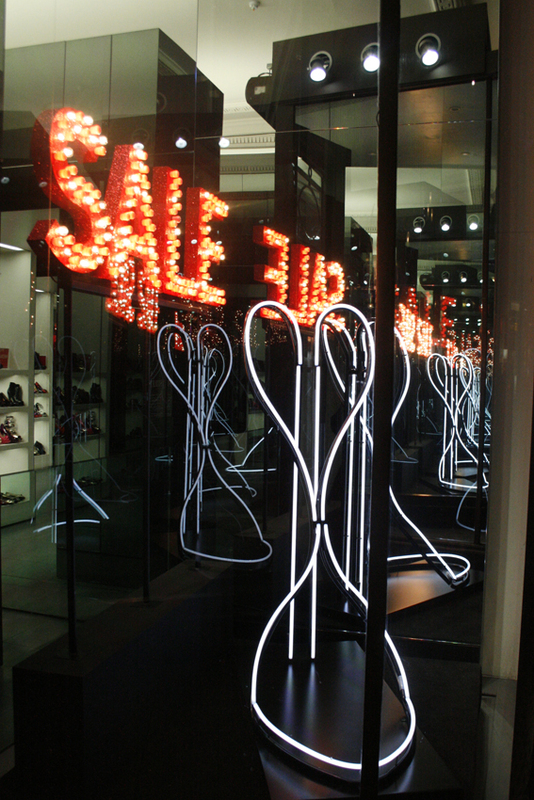 Neon light sign at Selfridges. 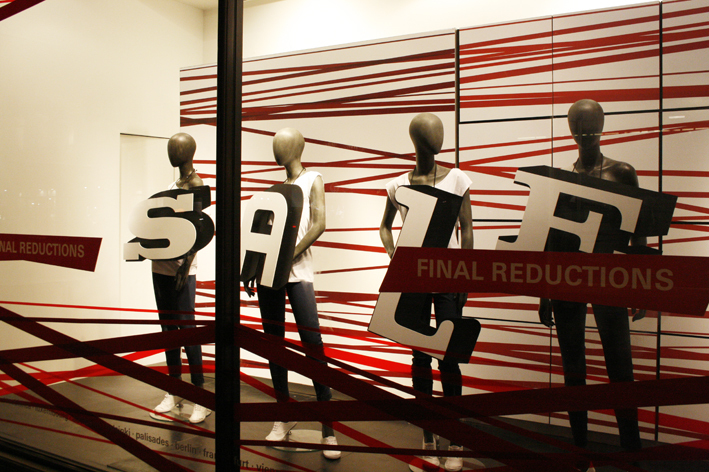 Most of the windows were vinyled with a simple sale message. The neon lights are definitely a trend this winter! Sale message on an oversized Aquascutum label. I like the stock they have chosen: red, white and black macs – it’s simple and effective. Diesel, Bond Street. 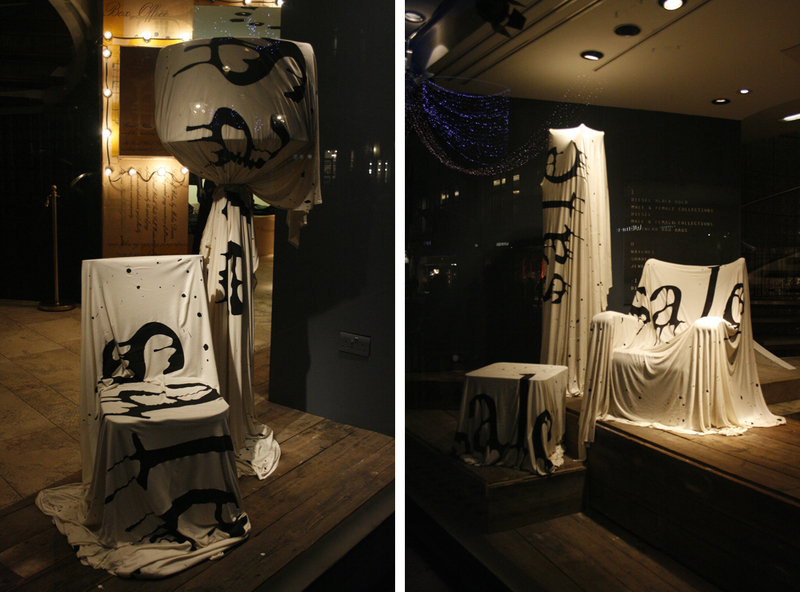 They have done something a bit different, covered furniture with white cloths that say sale in ‘creepy’ letters. Reminds me of furniture covered like this in unoccupied houses. Like it. 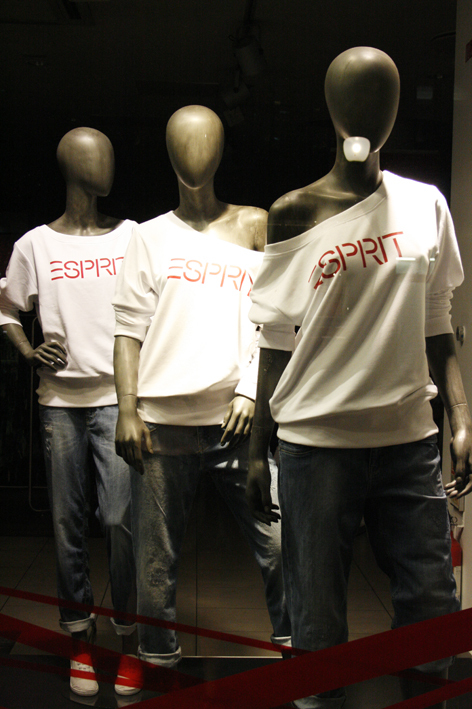 Esprit, Regent Street decided to cover their mannequins with red stretchy fabric. Quite funny. 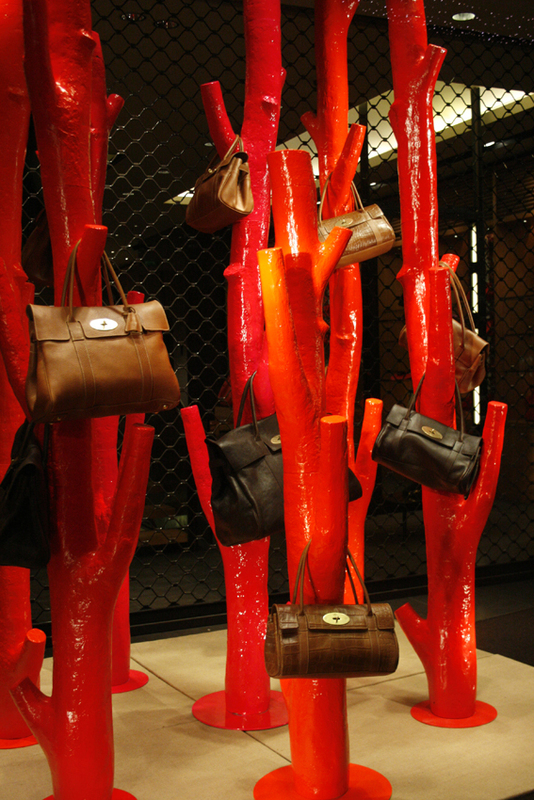 This is Mulberry on Bond Street. It doesn’t actually say sale anywhere so I might be wrong assuming that the red colour here means sale. 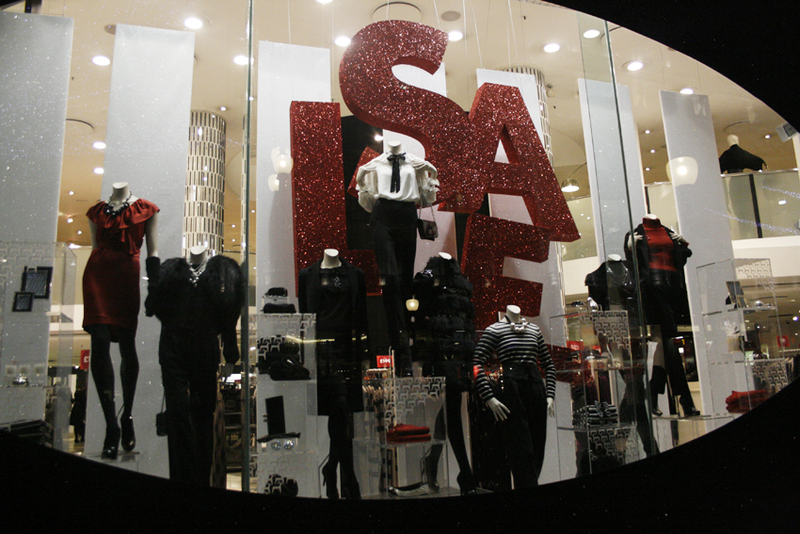 But use RED and people will wonder if the store is in sale and might just walk in.